India's golfer Gaganjeet Bhullar on Sunday won his maiden European Tour title at the Natadola Bay Championship Golf Course. 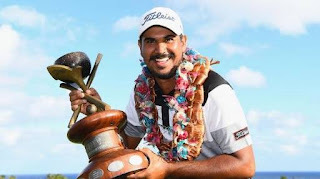 Gaganjeet Bhullar record-breaking charge from Australian Anthony Quayle to win the Fiji International by one stroke while Ernie Els shot a 7-under 65 to finish. It was Bhullar’s first win on the European Tour, ninth Asian Tour and 10th crown overall.